Elasto Proxy, supplier of specialty seals and custom insulation, announces light-up rubber bumpers that resist water and UV rays over a wide range of temperatures. Designed to protect pontoons, quays, docks, and embankments against the impact of water-borne vessels, these translucent elastomeric fenders use energy-efficient LED lights to indicate the location of structures and promote safety. Elasto Proxy, a global supplier of industrial rubber products, is announcing light-up rubber bumpers that resist water and UV rays over a wide range of temperatures. Elasto Proxy, a global supplier of industrial rubber products, is announcing illuminated elastomeric fenders that resist water and UV rays over low and high temperatures. Equipped with long-lasting, energy-efficient LED lights, Elasto Proxy’s light-up rubber bumpers can signal the location of pontoons, quays, embankments, and docks while protecting these structures against impact by boats and ships. Potential, additional applications for illuminated rubber fenders include healthcare, construction, and industrial environments. In hospital corridors, for example, light-up rubber bumpers could serve as rub rails that help protect patients, medical personnel, and equipment. Light-up elastomeric fenders could also signal the location of edges and railings on oil-refinery catwalks and construction scaffolding. 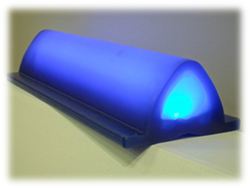 Elasto Proxy supplies illuminated rubber bumpers in two colors: translucent mauve and translucent blue. Products are available with vertical or 45° end-fittings with an optional fixing system in mauve or blue varnished aluminum. Light-up elastomer bumpers come in standard lengths of 5-m, weigh 5-kg/m, and are designed for temperatures ranging from -40° C to 90° C.
With an estimated life of 3 to 5 years, these water-resistant rubber products are 100% recyclable and feature integrated, low power-consumption, 24-V LEDs. The lights can be connected to a power source via cables or distributors. The IP68 option includes 1 brown cable, 1 blue cable, and 3 cables with cap and clamp collars. The light-up rubber fenders that Elasto Proxy supplies have been tested by France’s National Laboratory of Metrology and Trials, and passed the IP67 trials for temperature reliability and ingress protection (IP) against dangerous parts, solid foreign bodies, and water penetration. These reliable rubber fenders also meet the requirements of European Directives 2002/95/EC (RoHS) and 200/53 CE. Contact Elasto Proxy for more information, or request a quote today. Elasto Proxy designs and custom fabricates specialty seals, thermal and acoustic insulation, vibration dampening products and materials, EMI shielding, and other high-quality rubber and plastic parts. By listening to all of your requirements and analyzing all of your needs, Elasto Proxy’s solutions providers can recommend solutions that are right for your application. How can we help you?